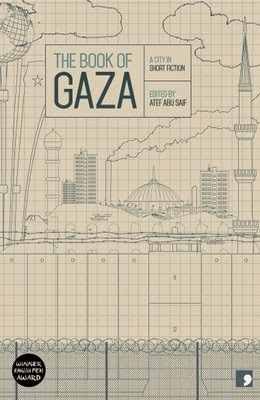 The Book of Gaza (edited by Atef Abu Saif, e-copy courtesy of the publisher) contains ten stories by Palestinian writers, each of which is set in the Gaza Strip. Like the other books in this series, The Book of Gaza has a mix of topics and settings, with stories from male and female writers presenting the reader with a privileged look inside the territory and allowing us to see the good and bad of life crammed onto a 25-mile-long strip of land. The book contains several short, fleeting tales, and the best of these is probably Talal Abu Shawish’s ‘Red Lights’ (tr. Alice Guthrie). It’s a story in which a grumpy taxi driver shows solidarity, and a human side, on his journey, his harsh words belying a caring interior. Another of these vignettes is Asmaa Al Ghul’s ‘You and I’ (tr. Alexa Firat). A simple, elegant story of a woman’s walk to and from university, it actually betrays deeper unease at what’s happening in her hometown. If you read between the lines, there are obvious wrongs on both sides in this story, but the frustrations and hardships of the Palestinians come across very strongly. The humiliation of curfews, forced assemblies and savage beatings serve to foster the kind of resistance the presence of the soldiers is meant to stamp out. A more hopeful look at a similar scene is Ghareeb Asqalani’s ‘A Flower for David’ (tr. John Peate), a story in which friendship blossoms between a Palestinian worker and an Israeli engineer. Despite the close relationship between their two families, their ties are tested by incidents that occur when the Jewish David is in the middle of his military service, and the writer wonders whether friendship can survive during an armed conflict. Depending on your viewpoint, you might see this one as far-fetched or hopeful, but it’s a ray of optimism in the middle of some pretty bleak events. Ramzi, waiting for his brother to cross the border, encounters his old university friend Samir, and the two reminisce, aware that their lives have not gone as well as they would have liked. …and this is the real importance of The Book of Gaza. While it’s a great collection, with several excellent stories, what it’s really about is turning abstract casualties into real people. Let’s hope that the book reaches a wider audience and manages to fulfil that vitally important task. I will see if my library has this one. I've been horrified by the bombing this past week. I don't know if hearing the voices of ordinary people in Gaza would change things, it rarely changes much in the rest of the world, but I think it would be good to hear their voices more often. A very interesting and timely post, Tony, and this collection sounds as if it contains some excellent stories; a range of different styles, too. Would this be eligible for the IFFP, do you think?